Today I had the pleasure of riding to Reagan National Airport from Georgetown in a taxi, driven by a bearded old man of Pakistani origin who identified as American and nothing else. My kind of story, naturally. We talked about various things on the ride; I made sure to ask his thoughts on Uber. Uber, as we all know, has revolutionized taxi service and is driving old cab industries out of business in the coastal blue cities. The taxi drivers’ unions are fighting back. It would be natural for my taxi driver to hold a grudge against Uber, which offers much lower rates than taxis and thus is more convenient for, and steals away the business of, many previous taxi customers. But that wasn’t why my driver held his grudge. Instead, he first explained that he had absolutely no grudge against other services that took away taxi business, like buses and shared-ride vans. These, he explained, follow the same rules and regulations as taxis- their drivers are required to have special licenses and go through background checks and training, they face stringent insurance requirements, and current policy requires that their members are unionized. But Uber faces no such requirements. The only requirements for being an Uber driver are that one be 23 years old or older, and that one possess a drivers license. Aside from these, there are no real regulations, and presumably the company is shielded from bureaucratic probing by its corporate lawyers and its influence in local governments that would otherwise regulate it. Thus Uber, which provides the same sort of service as the taxis, vans, and buses, is not operating on the same playing field as they are. It has a preferential regulatory environment, which means it can afford to offer lower rates to customers, which means it can out-compete them with an unfair advantage. This is not a free market system. Uber has an unfair advantage over the legacy models of taxis, buses, and vans. I’m all for creative destruction, innovation, and entrepreneurship. I think companies that can exploit gaps in the current business environment and get rich off of them are the modern captains of industry and the progenitors of the future. But, as Teddy Roosevelt said in his day, it is absolutely imperative that the playing field be a fair one, and that every individual and corporation has the chance to prove themselves in the market of public opinion and public choice in fair competition with their rivals. And Uber’s presumable unfair practices point out a bigger problem in American business and policy culture. Corporations in every industry, most notably finance and banking, but spreading out to construction, manufacturing, energy, tech, services, the various apps, and everything else, will refuse to play by the rules if they can, if it means they can make a profit off of it and get away unscathed. It happens every day, and is on the rise. The most time-tested way to combat this, aside from character in the hearts of CEOs, is sound government regulation and vigorous government intervention in every case of unfair practice. But, aside from the fact that governments at every level are inundated with money and favors from these very corporations that seek to bypass the rules, government itself is in disarray. Aside from being completely insolvent and relatively inefficient in its bureaucratic model, the regulatory system at all levels is too complex for the common good, and is oftentimes outdated. There is no reason a taxi driver should spend two years getting a license, but in some cities, that is the model. There are innumerable examples of draconian regulations impeding development and growth, and even more of corporations seeking every possible way out or just ignoring regulations entirely. Some corporations and industries, particularly unionized ones, are more wedded to these old regulations. But they make life hard for startup companies, the true innovators, and serve no useful purpose in the modern world. Mark my words, I WANT to see companies like Uber succeed. They can make a real difference in making life better and more convenient for hundreds of millions of Americans. Their networked model can integrate the powers of information technology with sound physical infrastructure, and thus open the ground for a more powerful economy than any our nation has ever known. But I want their innovation to be coupled with a sound respect for the rules of the system, and correspondingly, the rules of the system need to both be simplified and more stringently enforced. Therefore, two imperatives face us as a nation if we are to have a truly innovative and fair economy. First off, we must simplify our regulatory code en masse to make way for the Ubers and Airbnb’s of the world to compete fairly. We must break the power of unions and corporations wedded to the old model, and we must establish a system where innovative companies can succeed. Second, we must stringently enforce that said regulatory code, remove the influence of corruption in politics, and ensure that no level or agency of government is in any way beholden to any man or corporation. We are living in a social and political failure of massive proportions. My taxi driver was right- we need a fairer system. But we also need a better system. And the preservation of a truly free market, possible only with a vigorous and active government beholden to no interests, is the most truly conservative and truly progressive end we can strive for. May the great reformers of the 21st Century take these words to heart. As a moderate-conservative, middle class, straight white Christian male, and a boisterously vocal one at that, I run into trouble with these campus activists at USC all the time. It’s a cult of victimhood, a demonization of the ‘oppressors’ that shuts down reasonable debate in favor of the rights and feelings- emphasis on the feelings- of the ‘oppressed.’ It takes very important social issues and works its evil curse upon them, speaking of them in Manicheaen one-sided narratives against some invisible oppressor. It looks around and sees injustice everywhere, except within. I don’t really have anything intelligent to add to Chait’s analysis at the moment. Let’s leave it here. 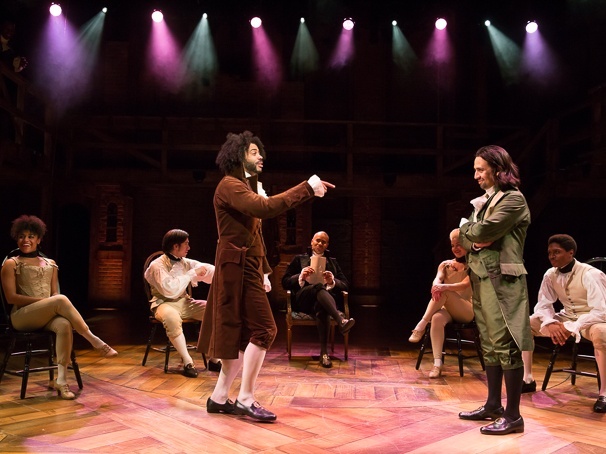 Daveed Diggs as Thomas Jefferson and Lin-Manuel Miranda as Alexander Hamilton engaged in a rap battle at one of President Washington’s Cabinet Meetings. Anyone who knows me- literally anyone who knows me- knows that I consider myself a proud Hamilton junkie, an acolyte of the fabled third way in American politics that encompassed such great statesmen as Hamilton himself, Henry Clay, Abraham Lincoln, Theodore Roosevelt, and Dwight Eisenhower. No American intellectual tradition has been nobler. 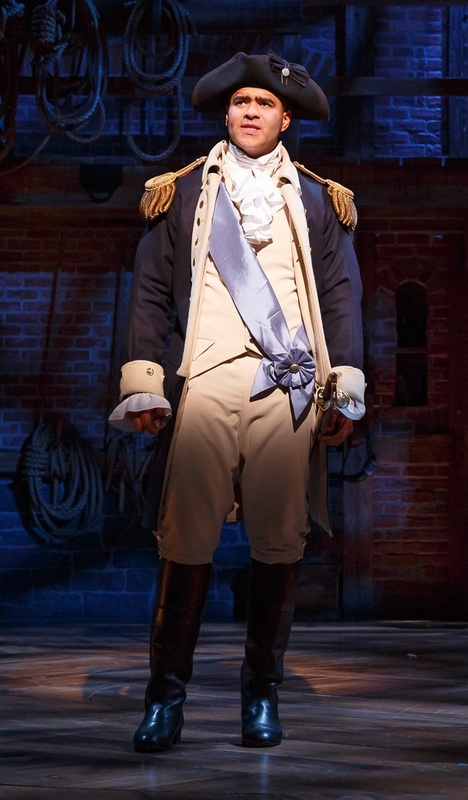 So it was with great joy that I learned, many months ago, that the famed Lin-Manuel Miranda was adapting Ron Chernow’s magisterial biography of Hamilton into a musical- and not just that, but a hip-hop musical. 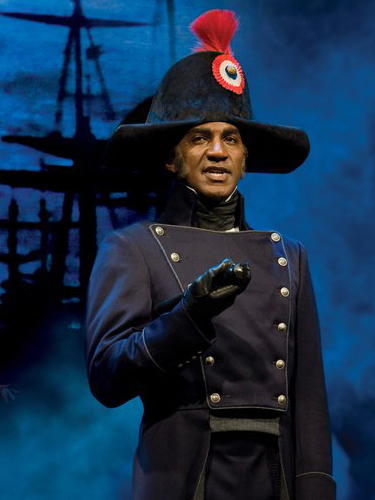 I’ve been familiar with the chilling pre-released first song in the said musical for several years, and I am still awaiting in deadly anticipation Hamilton’s tour on the West Coast. My sources say I’ll probably have to wait a year or so, which only sharpens my desire. Anyway, like any good fanboy I’ve been making a point of reading every laudatory article that came out since the show’s release in New York in late January, and I’ve liked what I’ve seen so far. Two key facts stand out above all, though. 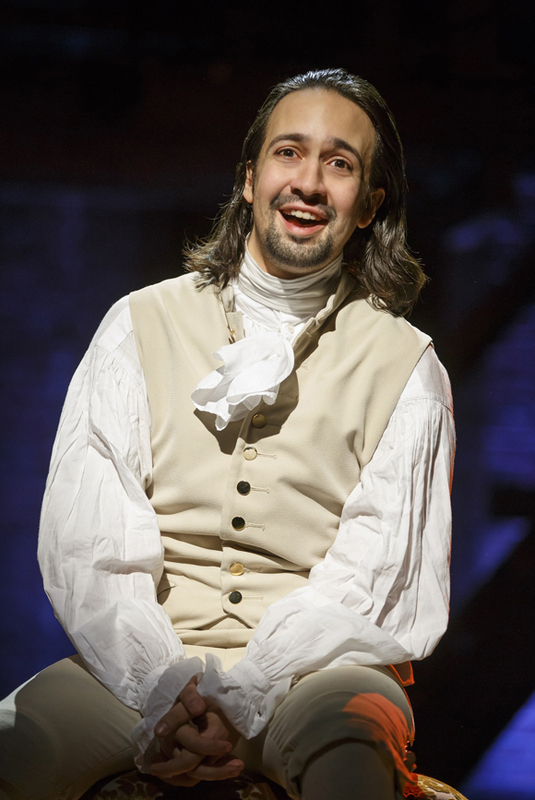 Second, the soundtrack of ‘Hamilton’ is a mishmash of classic broadway, Latin rhythms, 90s pop, and rap. This diverse score pretty closely mirrors the ethnic and cultural makeup of New York City. So first off- yes, I can hear it now. I can hear the multiculturalists and the ethnic nationalists hooting and hollering, lauding the production for being more “representative” of the American racial ground as a whole, a sort of penance for the great sin of white supremacy that has burdened the nation for centuries. The presence of hip-hop as the musical’s soul is a rebellion against white patriarchy. I can hear them snickering to themselves at seeing George Washington, Thomas Jefferson, and James Madison, slaveowners all, being portrayed by African-Americans in what I assume some of the multiculturalists must see as the ultimate irony, bordering on vengeance. I hear them calling this production a great mark of progress in race relations, when what they mean is it is a mark of empowerment- read, the transferral of power- to aggrieved minority groups, that they might have power as groups. When I looked over the cast photos, I didn’t see African-Americans or Hispanic-Americans portraying White Americans. I saw Americans portraying Americans. I see “Hamilton” as a step forward in race relations, too, but not a race relations of various groups competing amongst each other and scrapping for dignity- instead, it is the race relations of a nation of individuals of innumerable backgrounds, sharing a common heritage and a common destiny in the persons of their national heroes, and one which every one of them is capable of honoring regardless of the color of their skin. It represents a nation not of African-Americans and Hispanic-Americans and White Americans living together in racial harmony, but of Americans living together in national unity, where race might matter to individuals privately but has neither bearing nor influence in the public realm. That’s what this nation needs to be and that’s what Miranda was pushing for in the casting. It would have been no different had the main characters been portrayed primarily by Asian-Americans. They would have been Americans all the same, not representing their ethnic groups but representing the country as a whole. As a friend of mine put it, “Americans are black; Americans are white.” E Pluribus Unum. And nearly as important, the varying cultural influences behind the music don’t represent a host of cultures living together in multicultural harmony, but the mixing and melding of various cultures into an entirely new culture, something unique to our shores and genuinely American. This mixing and melding, a melting pot not of one-way assimilation but two-way assimilation, has been the driving force behind the development of our national culture for centuries, and has only been stymied by white supremacy in previous eras and multiculturalism today. A tearing-down of the walls which multiculturalism erects, and an allowing of the cultural blender to work its magic, as was done in “Hamilton,” is the true cultural fate of our nation. One might object that this multiracial portrayal was not ‘accurate,’ and indeed it was not, nor was it intended to be. It was intended to tell a story and to help a divided people of diverse backgrounds feel as though they were united in that single story. The historically all-white portrayal of the Jesus story in European culture is a manifestation of this trend (and it’s interesting to note that one of the few modern linguistically and racially accurate portrayals of the Jesus story, The Passion of the Christ, came around only after the majority of Christendom was no longer white.) There have been plenty of culturally-accurate tellings of the Founding story; this one sought to be not accurate, but powerful and uniting, and I would say it succeeded admirably. 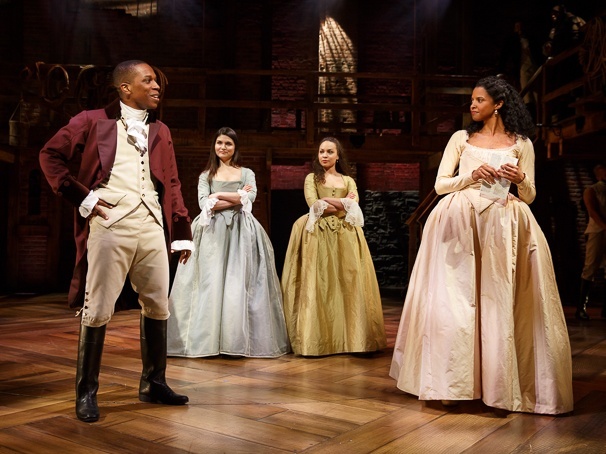 Again, I’m really happy about the racial and cultural message “Hamilton” seems to have given, though I’m not as happy with the explanation of it I attempted to give above. It pales in comparison to the sublime beauty of the American America. In short, here’s what I think about race teleologically and here’s what I think “Hamilton” said about race. -It doesn’t matter where you come from, what the color of your skin is, or what ‘community’ the media tells you you’re in- if you’re an American, that’s the most important thing. -American culture is a beautiful thing, with influences from diverse groups across the world influencing it. While it should be noted that our political culture is fundamentally Western European, just about everything else has been subject to cultural mixing and mashing, creating the beautifully pure hybrid we know today. -Multiculturalism and closed-minded white dominance are equally pernicious to the development of a truly unified American society, where Americans of all races are truly respected by their fellow citizens as Americans and nothing else. They merely attack it from different ways, multiculturalism by fighting for the existence of multiple cultures and white dominance by precluding others from entering the broader culture. Now, an interesting thought experiment would be to think what Alexander Hamilton himself would have thought about all this. But that is a case for another day. Republicans just went a step too far in advocating family rights over public responsibility. Such big names as Chris Christie and Rand Paul came out recently supporting parents’ rights to not have their child vaccinated, according to The Hill. And the sad thing is, the argument for familial autonomy over the health of children makes sense, so much sense- it’s just being misused in a potentially dangerous setting. That’s like parents insisting that they be able to choose how their kids are educated (a perfectly reasonable proposition, especially given the diversity of education options available today) and then insisting on homeschooling them a curriculum of marshmallow-eating, cinderblock-breaking, and dinosaur role-playing (a far less reasonable proposition.) Parents should have authority and command over the lives of their children, as it’s just the natural order of things and, moreover, the foundation of a strong society and of solid citizens. But that authority and command must be reasonable, lest it lead to the excesses that some paranoid parents and politicians take it to today in the Vaccination “debate.” From a purely utilitarian and preventative perspective, vaccines are necessary for the broader health of society. For the sake of public health, the wild-eyed paranoia of a minority of people who do not understand modern science should not be protected as a right. Additionally, for the sake of public health, the wild-eyed paranoia of another minority of people who do not understand modern science should not be protected as a right, either. I’m not talking about climate deniers here- more on them in later posts. No, I’m talking about the kind of person who calls GMO’s “Frankenfood” and who harbors suspicions that the megacorporation Monsanto has secret plans to poison our food and kill us all. I’m talking about green anti-GMO activists. The issue hasn’t been very big recently, but it’s only a matter of time before it rears its ugly head again. And when it does, thousands of good-natured, well-meaning people will share Facebook statuses about how concerned they are that eating genetically-modified organisms might be dangerous to the health of their great-grandchildren. Thousands of people will be concerned that a technological breakthrough that has the chance to improve the lives of millions around the globe will in fact poison them and their unborn families yet to come. Thousands will take a principled stance against Man’s unwise reckoning with nature, and thousands will be very sure of themselves in doing so. Sound familiar? The AntiVacs do it too. 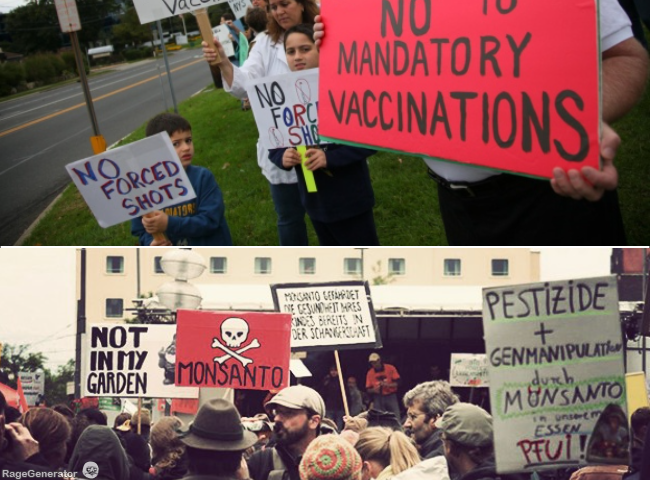 Both GMOs and vaccinations have been with us for a long, long time; in fact, GMOs have been with us for far longer. We’ve been genetically modifying organisms since we first started crossing grains together into bigger grains. In the 21st Century, we’re just doing it a lot more quickly and directly, by splicing genes into organisms that never had them before. Kinda scary to think about but, when you consider it, basically the same thing. These GMOs could feed thousands, millions more people, on far less land than current non-GMO crops are produced on. They could eliminate the need for dangerous fertilizers. They could be raised for a fraction of the cost. There is, indeed, a good environmental argument against them- that they might become potentially destructive invasive species- but that is a problem that local environments tend to adapt themselves to after long enough. After all, after the Spaniards lost a herd of horses somewhere in New Mexico territory in the vague 16th Century, horses became an invasive species fully integrated within the North American ecosystem, and what would the American West be today without its herds of wild horses? Don’t answer that. But I digress- the point is, technological change is scary, particularly in its social and political manifestations, but if managed properly it can be a true blessing to the happiness of Mankind. I think there was a really cute commercial about that, actually. Those arcadian anti-vaccers and anti-GMO types have no idea of the world they’re trying to make posterity miss out on. 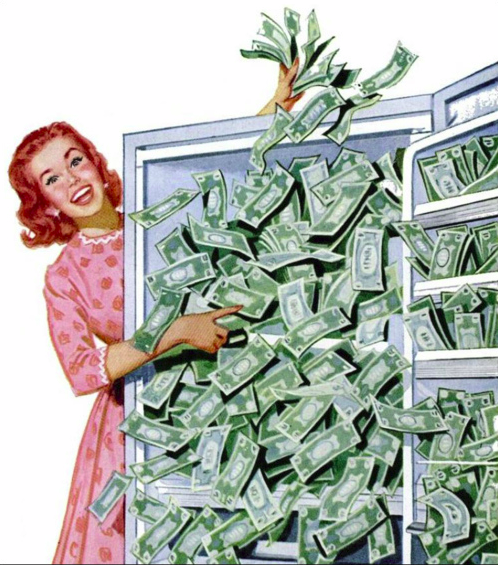 Americans of a populist persuasion like to pull out the name ‘Koch Brothers’ whenever the discussion of campaign finance reform (aka ‘money in politics’) starts to require hard empirical evidence. And it’s true- Charles and David Koch are documented to have spent hundreds of millions, if not billions, of dollars on political causes over the last couple of campaign cycles. All figures are courtesy of OpenSecrets.org. OK, so Soros caps off at $77 million on his own while the Koch Brothers combined go all the way to $118 million. But after so many tens of millions, does it really matter anymore? And moreover, if these three men happen to be the most generous of the ultra-rich donors, how many more ultra-rich donors does it to take to donate even more hundreds of millions to various political causes? The verdict is clear. There’s a lot of money in politics these days, and it comes from both the right and the left, funneling into the campaign coffers of politicians of various stripes and to the budgets of thought-organizations as diverse as the Center for American Progress and the Cato Institute. Joel Kotkin’s narrative of the rival oligarchies has never seemed more right. We have yet to see if a populist, anti-elitist movement of statesmen will rise up and seriously challenge the power of Mammon over Caesar; and however it rises it will have to come from either from the center or from both the right and the left, but neither the left or right on their own, lest the movement be (rightly) accused of hypocrisy. If history is any guide, we’ll last a while under the rule of the rich. But such plutocratic power invariably leads to decadence and decay, and therefore it is in the broader interest of the American nation that the interests of wealth be checked sooner rather than later. Every social scheme of justice and fairness is, in some way, a religion. There are many kinds of religions- the secular ones, the messianic and Auber-mystical ones, the group-identity ones- but they are all explanatory, mystical, and dogmatic– that is, they all seek to explain some of the unexplainable phenomena of the world like suffering and justice and creation, they do not purport to use inherently rational proofs to justify themselves, and they tend to view themselves as the most correct, if not the only correct, religion of all the various religions out there. And they typically claim themselves to be so obvious that if only the unbelievers would let the scales fall from their eyes and let themselves see the light, they would become believers. Religions rise up within societies and within social movements as unifiers, schemes of social control, and bulbs of hope for the oppressed of the Earth. And as geopolitics and human nature dictate that there shall never be a cessation of movement within human society, so it would appear that there will never be an end to the disagreements between the various religions, nor will Mankind ever be up and consumed by a single universalist faith. In fact, every individual can subscribe to multiple religions at a time without contradicting themselves, for the variety of religions implies that there will be some covering some areas of life and others covering others. The first of the two facts I described- the fact that there will always be varying religions competing for the souls of the unfaithful- leads us to an unfortunate Hobbesian state of nature in the field of religious and ideological relations. For no matter how much work of conversion any one religion does, there will always be a thousand more religions doing the same work and dealing with similar groups of people. And the principle of variety asserts that though there may be some general humanness to all of these religions, the mass of them will differ as far and widely as the differences of culture that have divided men as neighbors since the dawn of our species. They will therefore never coalesce into a grand coalition of intellectual unity, and will be at best squabbling in disagreement, and at worst drowning in each others’ blood. It seems to me that for the broader interests of humanity, it is important that a balance of power be played out between the diverse religions of Mankind, stretching from Christianity to Islam to Hinduism to Buddhism to Atheism to Judaism to Communism to Republicanism to Liberalism to Feminism to the various Nationalisms to Anarchism to even the most barely trans-cultural conscious schemes of social morality which I now choose to deem ‘religions’- any systematic mode of thought upon which two devout believers may have arguments over first principles. This balance of power is natural, but it need not be hostile; if the practitioners of every religion were to accept that though they hold faith in their principles, they do not know them to be entirely true, then perhaps we would see a greater toleration of difference, a greater religious pluralism, arising between the communities of faith. And a religion in which the huge majority of believers are so reasonable (or as some would say, lukewarm) in their faith as to not embark upon crusades and jihads and activist campaigns to change the minds and hearts of the heretical unbelievers, perhaps we could find happier and more orderly societies based less upon vitriol and more upon respect. Of course, the principle that no single religion must dominate any single society, lest it fall into the grips of Nazism or Southern White Supremacy, implies that religions must actively wage war upon each other to check the mutant growth of some, and preclude the attempted dominance of those which wish to dominate all life, mowing down every unbeliever. And this, I believe, would be just. But before we throw stones at others, let us first examine ourselves. Let us first examine the religions we hold to be true, and ask ourselves- are we attempting to force these religions upon the nonbelievers around us? Are we placing our minds above theirs, and their consciences below ours? Are we become crusaders in our own homes? Were these questions asked by honest individuals, I fully believe we would have a more pluralistic and peaceful world of a thousand faiths.